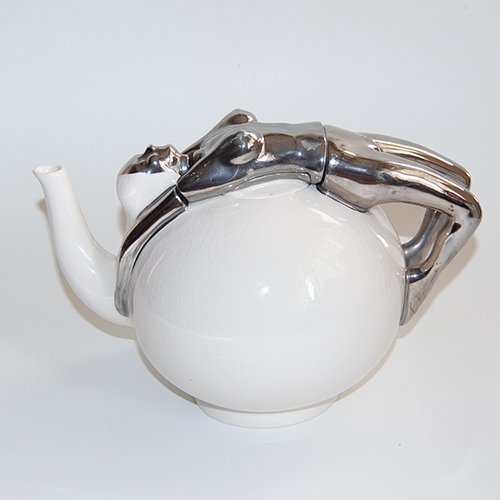 For delivery in the U. K.
www.Decorativearts.net is proud to announce the publication of WALKING WARE A COLLECTOR'S GUIDE, a Walking Ware publication which is published in association with www.Decorativearts.net and www.Lustre.co.uk . The book is written by Julia Michell (wife of one of the original designers of the range) and covers the background and history, production methods, a complete design list including a section on promotional examples and with chapters on identification, backstamps and marks, patterns and colourways and more. Fully illustrated with 240 illustrations. Finally we have it, the book that collectors of Walking Ware have wanted for decades. At last, using the Design List, sections on Identification, Backstamps and Marks and Patterns and colorways, collectors will have the correct information to distinguish and identify what is genuine, earlier or later and thus what is copied or fake. The design list is complete and therefore contains some extremely rare items which are fully illustrated. 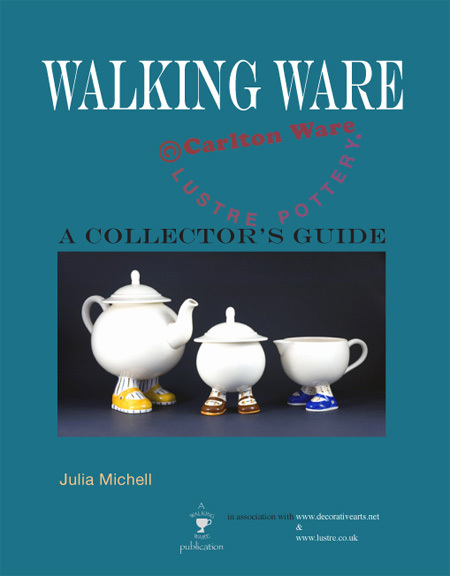 There is even a section at the back, in which collectors can itemise and record their own collections and purchases or use to track prices of walking ware items they come across. Beginning with a preface by Christopher Strangeways (who first marketed Lustre Pottery's hand made Walking Ware in his now legendary Kings Road shop in London during the 1970s), Julia Michell has written a lucid and accurate account of the entire Walking Ware phenomenon, detailing its progress from its original conception by Roger Michell and Danka Napiorkowska, and following its various stages of manufacture from the now rare initial hand thrown studio pieces , moulded studio pieces, Rising Hawk's Long John Silver range, to the liaison lasting a decade between Carlton Ware and Lustre Pottery in which large scale production satisfied the world's demand for these endearing and ironic ceramic creations, and finally followed by the (post Carlton Ware Lustre Pottery) handmade signed and numbered limited editions produced in small numbers by Lustre Pottery in the studio. Modestly priced at £10.99, containing 112 pages and 240 illustrations, this fascinating combined history and reference work is a must-have for any collector or dealer of Walking Ware ceramics, but will also provide an insightful record to anyone interested in one of the 20th century's most popular collectible ceramic phenomena. £3 Postage to UK & £5 Postage worldwide.To purchase a copy instantly use one of the PayPal buttons above. If you want to buy multiple copies (there is a postage discount), wholesale enquiries or you wish to pay by cheque or other methods, please use the contact link above to tell us your requirements and we will send you the relevant payment details.